First off, Brian finished his Bible course and everything is in line for his graduation! Now I’m furiously seeking information on distance Master degrees and courses. Next, I had my eye appointment with Dr. Craig and checked out with 20/20 vision! Praise the Lord! 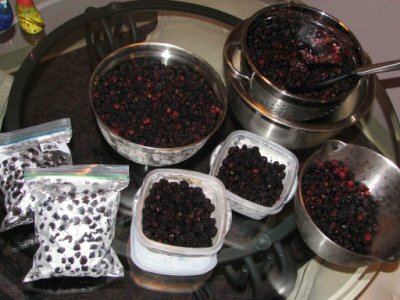 Another project taking a bit of my time has been picking berries. Here is the extent of my labors. I have jars from Brian’s mom and as soon as I get sure-jell I’ll be making jelly. 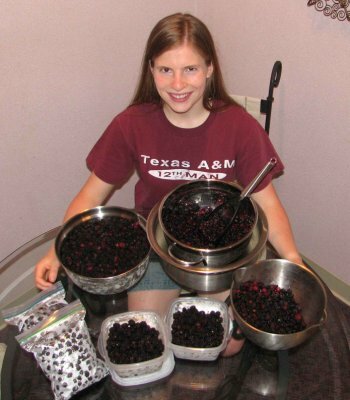 Here is me with all the berries right before I mashed most of them for juice – I got nearly a gallon! 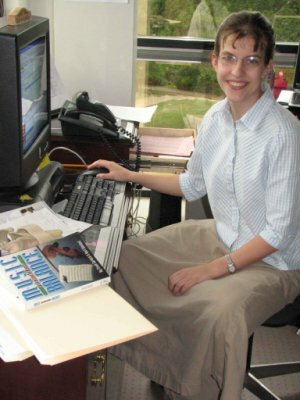 We also have a new addition to campus: my sister Lori! She’s here to work in the STEP office for the next six weeks. I’ve been having a good time getting her acclimated to ins and outs of my favorite ALERT program. She also helps with the garden work, housework and dishes.